The first half of this semester was hard. Weird schedule, lots of new pressures and responsibilities, and a lack of energy. Unfortunately lack of energy is a vicious cycle--no energy to cook good stuff = eating out; eating out = not always eating the best foods; not eating healthy = no energy. could be made with things easily found in Taiwan. Finding meals that meet all four requirements was no small task! Although Lawrance is generally easy going and not too picky about food, finding things we both love to eat often has proved to be a challenge. 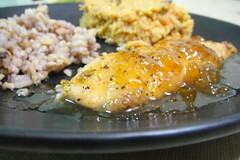 So, my first recipe test was something I found at Cooking During Stolen Moments: Apricot Chicken. It was SO easy and best of all packed full of flavor!! This is probably the least low-carb recipe I collected since it uses apricot jam, but it is definitely something I'll be making again before too long. Side-note to anyone in Taiwan wanting to give this a try: I used half of a jar of Carrefour brand apricot jam (french name on bottle) to cover 6 chicken breast quarters. Well... i gotta say, "That's GREAT!!!!" SOOOOOOOO YUMMY!!! Amanda! Yum!!! I'm bookmarking this post for reference. . . . totally needed that! As for my ornaments, yes, Joey and Paul were miscarriages we had before Hannah was born. It's hard to believe that had my 1st pregnancy been successful, I'd have an 8 year old! Regardless, had they been successful, I wouldn't have my babies, so I know that my life is blessed. Can't wait to read about your Christmas together. Hi Amanda! Just stopping by from the Women Living Well Message Board! I'm so glad you joined the discussion. What a fun blog you have here -thank you for the window into your life!!! Keep walking and serving the King! my two clowns like grandfather, like husband . . . or something like that. :) I love my two clowns!! Besides sharing a similar costume idea, my two clowns both LOVE children and are also both great big kids at heart!! Gotta love my clowns!! the wu's year in photos Even though I've let my blog slip majorly in the past few weeks and months, I couldn't let my blogaversary and annual tradition of choosing one photo per month slip past. This will be my fifth year to do this: 2005--was my third year in Taiwan, and I started blogging 2006--my sister got married and my brother came to Taiwan 2007--I moved to a new city, and my cousins came to visit 2008--I met the love of my life; we dated, got engaged, and then married . . . it was perhaps the most perfect year of my entire life. :) I think I took less photos in all of 2009 than I did in many of the months of 2008. Kinda makes me a little sad, and makes me want to resolve to take more photos in 2010. Anywho, not analyzing anything right now, which I am OH so tempted to do. Let me get right to the point . . . below you find a month by month look at our 2009 using only one photo per month. January: We celebrate our first Chinese New Year together in Meinong February: New Life Bilingual Church in Kaohsiung starts meeting March: We marry again . . . well, ok, we celebrate our marriage covenant in Taiwan with our Taiwanese friends and family April: I have my first birthday as a wife (aka, I turn 31) May: Some of our friends marry . . . and Lawrance is the MC at their wedding banquet June: We start our summer Sunday afternoon tradition of eating ice after church July: We go on several dates during the summer . . . Thai food, the beach and more August: We celebrate our first anniversary in Kenting September: Sadly Wu Mama is diagnosed with liver cancer October: Lawrance is a clown (well, maybe he always is one, but at least he LOOKED like one this time) November: I start studying Chinese again (This is my awesome Chinese teacher) December: Law's parents help us to decorate our tree . . . a Wu family first!